Doctors advised Danielle, 24, and her husband, Andrew Smith, 31, to abort the baby, because a brain cyst meant a probable disability. Doctors continued to monitor the baby’s cyst throughout Danielle’s pregnancy. Finally, after waiting 18 more weeks, Danielle was induced at 39 weeks. Danielle gave life to a daughter, Daisy. While many times children with dire diagnoses in pregnancy turn out to be perfectly healthy, this time little Daisy did indeed have a birth defect. “Anophthalmia,” a Greek term meaning “without eyes,” is the name for an incurable disability in which the child’s eyes fail to form in the womb, leaving the eye sockets empty. “But she is our gorgeous baby, and we have no regrets about turning down a termination,” the courageous mother declared. 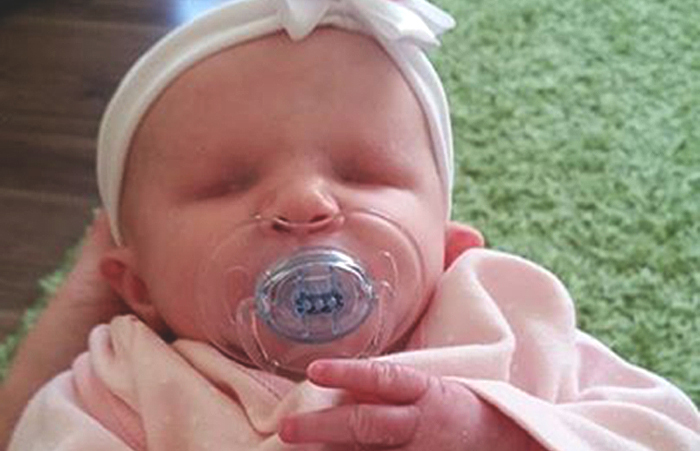 Now eight weeks old and at home in Cwmbran, South Wales, beautiful Daisy acts “like any other baby” with her brothers, six-year-old Logan and four-year-old Tyler. “We want to give Daisy as normal a life as possible and give her the same opportunities as other children,” Danielle and Andrew said. Later this month, Daisy will be fitted for glass eyes, to open up her eye cavities, so as to ensure that the bone and soft tissue around the eye socket grows properly. These will be replaced when she is about a year and a half old with more permanent, natural-looking eyes. They also want to raise awareness of anophthalmia. The condition, which develops in the womb, may be caused by genetic mutations and abnormal chromosomes. Babies with anophthalmia may be born with one or both eyes missing. Researchers theorize that environmental factors, such as exposure to X-rays, chemicals, drugs, pesticides, toxins, radiation, or viruses, increase the risk of anophthalmia. Danielle and Andrew are now planning a 12,000-foot skydive to raise awareness of anophthalmia, and to raise funds for the Royal National Institute of Blind People charity. They hope to raise £2,500 (approximately $3,700 U.S.). This amazing couple, whose unconditional love overcame their baby’s disability to give life, face the need for even more prayer. Last week, a test revealed that little Daisy is partially deaf, and she will be fitted with hearing aids soon. To help sponsor the couple’s skydive, visit www.gofundme.com/q5n3ew. For more information on anopthalmia, visit www.macs.org.uk. Editor’s Note: This article originally appeared on LifeSite News on April 13, 2015, and is reprinted here with permission.